Colorado artist Frank Mechau (1904-1946) created works of enduring potency and beauty that have earned for him an important place in American art. Much of his best-known artwork depicts scenes inspired by the American West, scenes rendered in a distinctive style that conveys elegant movement and fluidity in the arrangement of figures and forms. Central to much of his work is a deep love of the natural world from which he abstracted both monumental and delicate elements. He particularly loved the beauty of horses, their forms and their movement. 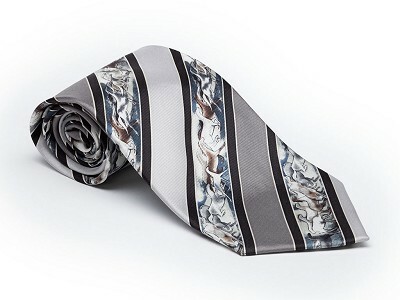 This tie is inspired by Frank Mechau's "Wild Horses" artwork. 100% silk; 56" long; 3.5" at widest; dry clean only.